First published in 1990. This title, originally a Ph. D. dissertation submitted to the Department of Philosophy at Harvard University in July 1988, grew out of an interest in the foundations of twentieth-century analytic philosophy. Believing that the idea of the primacy of judgment was an important one for understanding more recent issues in analytic philosophy, the author started to think about its historical antecedents. 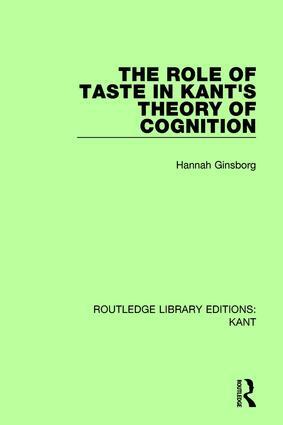 By examining Kant’s Critique of Judgement, Ginsborg explores the notion of a judgment of taste, as a judgment which has intersubjective validity without being objectively valid, and therefore bear’s directly on the notion of the primacy of judgment as an aspect of Kant's account of objectivity. This title will be of interest to students of philosophy.